Ravi Malhotra provides some tips for not getting off topic and distracted while carrying out the Scrum side of Agile methodology. 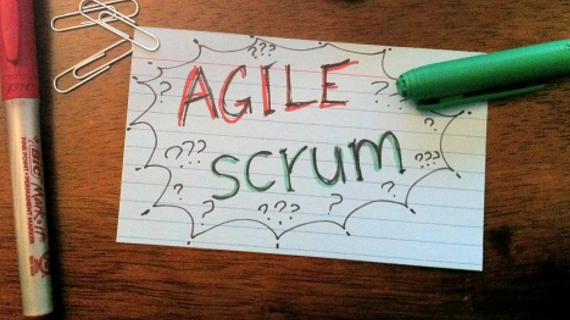 When most of the people think of Agile methodology, they think of Scrum. Scrum is the most widely used, daily meeting where your offshore software development team gathers to discuss project status updates about what is going on, what needs to be done, and if there are any issues. However, it is not that easy to smoothly conduct Scrum meetings while following an Agile methodology. Your team might be sitting in another part of the globe. Hence, what happens is people get off topic and get distracted, and, next thing you know, what should have taken only 15 minutes is now taking an hour. Therefore, our experts of Agile methodology at ValueCoders have come up with certain strategies to help you out. Here are few of them. Daily Scrums that run too long aren’t very effective. People get distracted, stop listening, and get off topic. At the end of the day, you come up with scattered decisions. That’s why limiting your meeting time is very important. To run an effective Scrum meeting, the daily stand-up should go about 15 minutes. You can implement the formula of 2n + 5 minutes, where 'n' is the number of team members. Further, by sticking to the three-question rule, the team will get all the needed information within time restrictions. The three-question rule is an effective one if implemented properly. However, in many cases, we see that the team members are clueless about what to answer specifically. As a result, they end up providing incomplete information or extending the time of the meeting while trying to think of the right question. Ideally, your team members should come prepared with their answers on a daily basis. Reward those who do and take aside those who don’t. Explain how being prepared with these answers helps the team, and ultimately the project, stay on track. The first five to eight minutes goes to waste with people waiting. There is always someone who does not come on time and the team waits for his or her presence. These eight minutes are a waste for the complete team which in turn brings 8*(n-1) minutes loss to the project. It is highly suggested to not wait for anyone. If the meeting is at 10:30, then start at 10:30 only. This will ultimately push those late comers to attend the next meeting on time. When you’re running conducting Scrum meetings following Agile methodology, make sure that there are no misses. The inconsistent communication between team members may lead to overlooking minor issues, which in turn can become a big gap. Consistent communication is the key to making these meetings as effective as possible in getting the program running. An update on a daily basis never lets you lose the hold on your project. Moreover, you will avoid the shocking pitfalls if you all are on the page. The daily stand-up provides an opportunity every day to communicate issues and improvements to getting our work done. However, if obstacles are not raised, the Scrum Master can’t help remove them. A team member waiting to raise an obstacle until it’s too late to recover from is not at all acceptable. Hence, it's better not to play hide and seek. Your team members should talk about the issues as soon as possible so that they come to the Scrum Master's attention. In most of the cases, issues raised early cause less harm. Sitting is comfortable. You may run a meeting for hours when you are sitting and discussing. Because of this, sometimes we take more time than needed. When in a Scrum meeting, if everybody stands and talks, then likely it takes less time. This is obvious because nobody wants to stand for a long time. As a tech company, we all are attached to our gadgets. In the Scrum meeting, if the team members are allowed to carry their laptops or mobile devices, then there is a good chance of getting distracted. Therefore, as you don't want distractions in your 15-minute Scrum meeting, it's better to keep the meeting a tech-free zone. You can ensure that an effective Scrum meeting will never occur while members are playing Angry Birds on their cell phones. 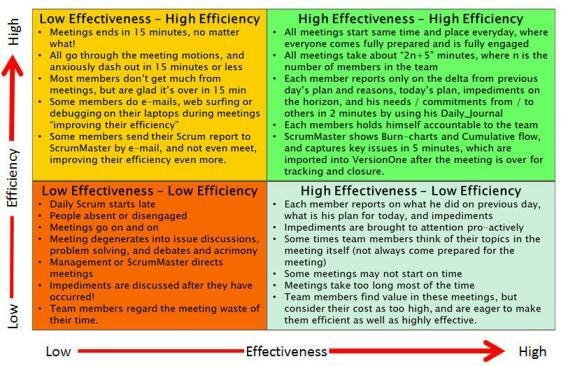 The above mentioned seven points are certainly going to help you to improves your Scrum meeting loopholes. Now it's up to you how to manage the situations in your cases.